1. pretty scarves. above: drakes london scarf from jcrew. 2. good soap. above: milk & honey soap from humunuku. 3. fancy notebooks. above: panama diary by smythson. 4. something unique. above: reclaimed china butterfly by lightly (via little white whale). I love the color scheme. I'm sure my mom would love the scarf. aw, i wish we could actually spend mothers day with our moms. 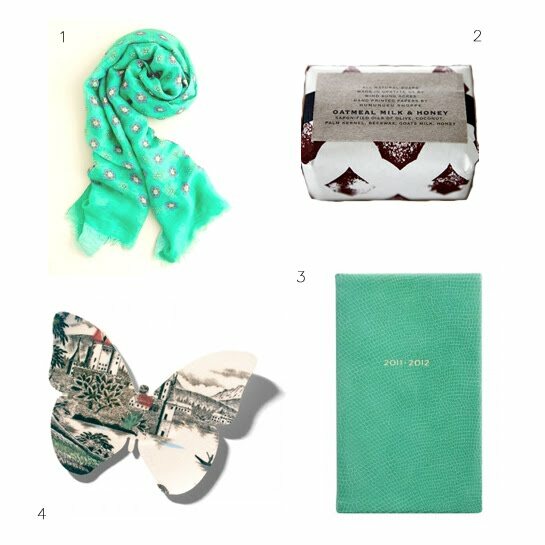 i bought my mom a cashmere summer sweater and sent it to her last week with a little card i drew :) i love the idea of good soap and pretty scarves. your picks here couldn't be prettier! Great picks, I find that I'm wanting these all for myself. That's always a sure sign of a good gift. a good bar of natural soap can make a wonderfully sweet and simple gift. good picks! pretty picks! I love that scarf. I ordered my mom a dainty jeweled necklace on etsy. I'll post about it after she opens it :) my mom reads my blog so I can't ruin the surprise!! haha. Love pretty printed scarves. I'm so glad you reposted Little White Whale's amazing butterfly find. Gloria's posts are the cutest!